Mentsuki Waza 'The Taboo Techniques'. By Steve Hyland. U.K.T.K.F. Edinburgh Course. Report By Kenny Taylor. Meditation & Karate. By Ken Hollows. KENSUKE SETO 6th Dan J.K.A. Interview By John Cheetham. JOHN WATERS 5th Dan. Interview By John Cheetham. I.S.K.F. 1991 Summer Camp. Report By Doug Walsh. Dave Hazard-Aidan Trimble Course. Report By Vanessa St. Clair. K.U.G.B. Lancaster Kata Course & Kodokai Visit JAPAN. T.S.K.K. Course & Sensei Kase Visits Scotland. S.K.I. New Honbu Dojo to open in Japan. After all the bitter disputes between the two factions of the J.K.A. (Japan Karate Association), and the disappointment this has caused to all SHOTOKAN practitioners, I've purposely used the beautiful photograph of the late J.K.A. Chief Instructor, MASATOSHI NAKAYAMA (photo courtesy of HISHA U.K.) on the front cover, as a gesture of peace and unity. Master Nakayama was far senior to all these people who are now fighting over the J.K.A. name and he must be turning in his grave at what has been going on the last couple of years. 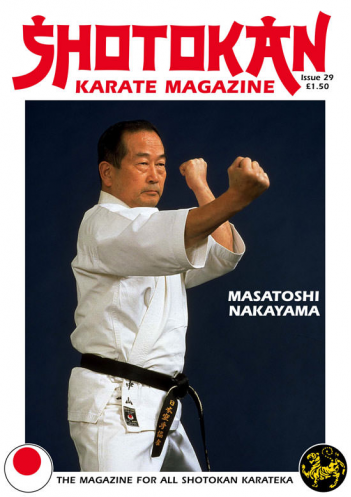 The world would not have SHOTOKAN Karate had it not been for the efforts of MASTER NAKAYAMA to spread J.K.A. Karate worldwide. I hope you like the material in this issue. We have interviews with J.K.A. 6th Dan, KENTSUKE SETO, who toured the U.K. in July 1991. Also a hard-hitting interview with JOHN WATERS 5th Dan, who pulls no punches in this good 'TECHNICAL' article about what he feels is 'effective' karate. 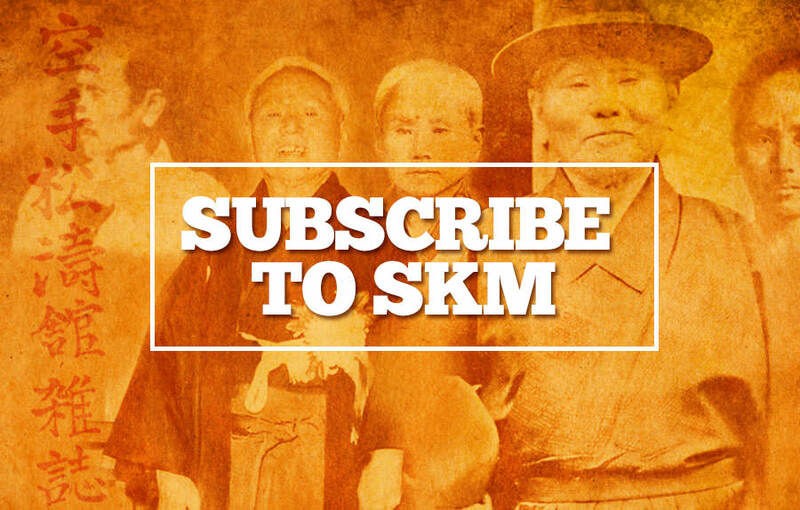 Two other writers appear in S.K.M. once again who certainly 'Tell it like it is': Steve Hyland and Ken Hollows. I personally really enjoyed both their contributions to this issue. A most commendable new book written by Shotokan Karateka DIRK ROBERTSON 2nd Dan F.S.K., is now available in the shops: 'MARTIAL ARTS FOR PEOPLE WITH DISABILITIES', published by Souvenir Press Ltd. I honestly think we should all buy this book to simply remind ourselves how damn lucky we are! When you see someone practising the arm movements from KANKU DAI from a wheelchair, it puts everything into perspective. So, next time we moan about that bruised leg or aching knee, just have a look at this book. Well done Dirk, brilliant stuff. I've been requested by a major News-trade Distributor to publish the magazine bi-monthly from 1992 instead of quarterly. I'm giving this some serious thought, because I've seen what happens when magazines are just churned out. The content takes a nose-dive. Anyway, we'll see.